Hammering down this half-track the engine took a quick look at his gutter bunny to see where he was, and missed seeing a death cookie. Causing him to endo hard. Making him first blood of the night and have bacon on is elbows for weeks. 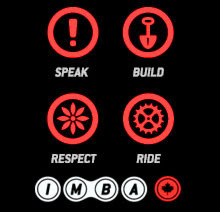 Mountain bike culture is as diverse as any sport. With that comes a verity of slang. To help out the CTS / MTB newcomer I found this very cool and fun Mountain Bike Slang Dictionary. Check it out. Cheers To a Great Ride! Old and in the Way - MTB Huntington State Park.